When we want something to get done right, we always make sure to get the right tools for the job. These tools will provide us with the perfect results that would make any, work about no problem at all. A workers tool is important because it’s the bread and butter of his toolkit. When you have those branches in your garden you would like to cut. The most reliable equipment you need to cut the time is the Lopper. And, if gardening is your passion, you might want to know what are the best loppers that money can buy. 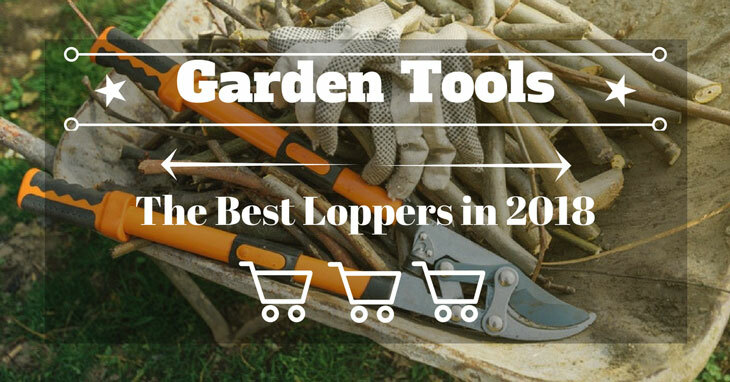 For every gardener, using loppers is the fastest way to prune out small branches and twigs. So where can you get the best loppers? One way of getting this tool is by visiting your local mall or in hardware stores. But one of the most efficient ways of looking for the best loppers is by searching in online stores. You can easily find the best loppers in online stores with a few clicks of a button. There you can find different types of loppers for specific kinds of work. Loppers that are being sold on the market come in different designs, prices, and sizes. That’s why it’s important to know what kind of Lopper you will buy for the specific activity that you will be doing. Things that you might want to consider include your budget and the type of work that you will be doing. One of the many characteristics of loppers that you need to look out for is the blades. Loppers have typically two kinds of blades, the anvil lopper, and the bypass loppers. Each blade is designed for a specific activity which depends on the kind of pruning that needs to get done. The definitive feature of the Anvil Loppers includes one straight blade. That is used best for cutting old wood and pruning hard branches of the trees. 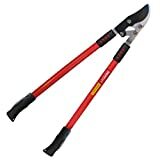 They work best for trimming thicker branches as it works as a cutting tool that cuts the branches of the tree. The finishing touches of an anvil lopper leave clean cut that would make any gardener smile. The Bypass Loppers have two blades that work like a giant scissor which cuts branches of the tree. This kind of lopper is the most common tool used in pruning trees, shrubs, and bushes. Depending on how well the blades are maintained. It produces a clean cut which is perfect for beginners. This kind of lopper works best if you want your plants to look clean and have a perfect cut. Lopper blades are made up of metal components and fibers. This affects the quality of the blade one way or another depending on the type of metal used to craft the blade. The blades that are most preferred by gardeners are those made up of carbon steel. Blades made up of carbon steel have long and lasting qualities. This, in fact would guarantee you your money’s worth. With different kinds of loppers, each has its own action employed to move its parts. Most loppers use only three actions which are compound action, squeezing and leverage. To put it simply, the main action of each gear is as simple as squeezing and releasing. This mechanism allows you to make cutting easier and accurate than any other tool. Each moving part of the lopper is geared towards making your work simple yet effective. The grip or handle is one of the parts of the lopper that serves as a protection to your hands. When you’re gripping to the lopper during gardening, it’s important to know the value of the grip. Each handle is built differently and uniquely which is useful in different situations. Most grips are made of flexible material which is great for control and accuracy. There are others that produce handle that is made from soft material which is comfortable to use. But, these types of handles have a high chance of deterioration. Another aspect that you might want to consider when buying a lopper is the availability of the parts. When loppers are overused, it has a tendency to wear off and become dull. Because of this, you might want to buy a new lopper, but buying a new set of loppers can hurt your finances. That’s why, before buying a lopper, always check if there are spare parts available. So that you wouldn’t need to buy new loppers. A durable lopper doesn’t need a spare part, granting that the quality of the materials used should last a long time. But, if you’re in a bit of a tight budget, a cheap lopper with available parts might be what you’re looking for. Action and effectiveness when combined creates a well-defined lopper. This kind of lopper is the one that might what you’re looking for. The quality of a durable lopper rests in its action, effectiveness, and comfort. Before buying, always inspect the lopper of its materials and available parts. Consider these options before buying a lopper. This might help you get your money’s worth and your efforts rewarded for buying a nice and quality product. The Fiskars 28 Inch Bypass Lopper with its long reach advantage is built for hard to reach branches. Equipped with a strong and well-built frame, this product can last for a long time because of its built. It’s light-weight and doesn’t give a huge strain on the shoulders when exposed to prolonged usage. The rubber grip helps those with wet and sweaty palms so that it wouldn’t slip off when you’re working. Comfortable and easy to use especially for those who have age and like to prune their trees. Not lightweight but not overly heavy. A small person might have issues with using these overhead for extended periods. Comfort grips really are comfortable. Nice size, soft and rubberized. Do not slip in sweaty hands. Will cut through thick, hardwood stems with little to moderate effort. Suckers and small branches cut with minimal effort. Has a short blade not suitable for big branches. Longer length means that it’s hard to use in short distances. With its reach and solid build, the GG12 compound Anvil Lopper is one of the best anvil loppers of its kind. Equipped with carbon steel, the blade of this lopper can cut through even the hardest of branches. 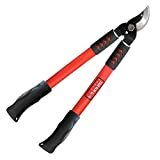 This makes pruning a fun and relaxing experience for any gardener or ordinary person. Like other anvil loppers, its grip is made out of rubber. This makes for easy handling and comfortable experience for anyone who uses it. The GG12 Compound Action Anvil Lopper might be the lopper you’re looking for. If you need something durable and reliable when pruning your plants try out this lopper. Tight grip rubberized handle with no slip or slide. Has a long reach advantage when cutting those far-off branches. Quick action and fast cutting feature. Extra strength and leverage and to efficiently navigate around higher limbs. The Long frame makes short prune areas hard to navigate. The Rubberized grip may deteriorate over time. Short blades could not cut bigger branches. If you’re looking for a well-rounded lopper for gardening or pruning. The Fiskars PowerGear2 Lopper (32 Inch) might be the one you’re looking for. Equipped with a new and improved power gear technology. This 32-inch long lopper is great when it comes to hard to reach branches. The optimized gear of this lopper gives it a better cutting power compared to other loppers. It can even cut the deepest parts of a tree with its extensive power. With its fully hardened blade, this lopper would sure to last even if used daily with close to no defect. Equipped with a power gear technology. 32 inches for longer reach. It can cut through the innermost portions of the branches. Optimized gears make it stronger than other loppers in the market. It is built with a nonstick blade for easier cleaning and maintenance. Great for power cutting and quick trims. Hard to grip and control because of its extensive length. Not suitable for short distances because of long reach. Because of the length, it is heavy to use. The tabor tools GL18 20-inch mini lopper is the tool that you might be looking for. This is because of its short but accurate cuts and fine build. 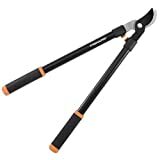 This tree trimmer and cutter is the perfect lopper if you’re looking for a lopper that’s for those easy to reach places. Featuring a durable frame, this 20-inch lopper can cut, chop, and crush branches with ease. Its sharp blade and rubber grip is perfect for those low-level spots for gardeners to use. Because its small, it can be stored easily and it can be carried anywhere with ease. Having a mini lopper in your house can do great wonders for your gardening activities. Equipped with POWER THROUGH 1 for branches and stems. Provides a quick and easy chop. Designed for fast but accurate cuts. Built with rubberized handles for accurate and clean cuts. Easy to store because of its small length. Its short length could not reach high branches and stems. Not suitable for thick branches. Rubberized grips may brittle over time. The ML TOOLS Easy Cut 30-inch Ratcheting Hand Lopper L8229 is one of the go-to loppers that buyers prefer. 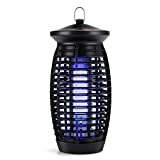 This is because of its affordable price and excellent value for money. If you’re a little tight on the budget, this lopper might be the one for you. Built with a high carbon steel blade with a ratcheting mechanism. This lopper is perfect for those hard to reach areas. With its aluminum frame and non-slip handles, the weight of this lopper wouldn’t be an issue. This lopper is worth its value because of the design and mechanism built into its frame. This lopper might be one of the best loppers in the market today if you’re looking for a durable lopper. The frame is Light-weighted with aluminum handles. Hard to store because of its length. Aluminum handles may deteriorate over time. After weighing all the pros and cons of each reviewed loppers it’s time to make a choice. For me, it’s safe to say that ML TOOLS Easy Cut 30-inch Ratcheting Hand Lopper L8229 is the clear winner here. When it comes to performance and cut, the ML TOOLS Easy Cut 30-inch Ratcheting Hand Lopper L8229 is what you need. What sold this product to me is that its blade is durable and the frame is light-weighted for a lopper. Having this tool around when pruning trees can save you hours of trimming and pruning. “Smooth and easy” is what most people say about this lopper. It can even cut with ease even if it is a living or dead branch in one snap. This lopper might be the answer to all your pruning and gardening problems. So, if you’re looking for the best lopper of 2018. Then ML TOOLS Easy Cut 30-inch Ratcheting Hand Lopper L8229 might be the lopper for you.